Back in the day (the way-back day) when I was in college, I had a brief love affair with minestrone soup. I can’t remember my mom ever making it at home, nor do I remember having it from a can at any point, so I had already spent about 20 years on this earth without minestrone being on my radar. Enter night class. One particular semester I had a night class in a building that was on the outskirts of campus. (As outskirted as you could be up on the bluff!) I would always wander over to Fisher Hall a little early and stop at the little cafe that was nestled in the bottom floor of the building to grab something to eat before class. On a particularly chilly night when I was craving something warm I decided to try the minestrone soup. Not being a vegetable lover, I was shocked at how much I adored that little bowl of soup. I loved the warmth, the heartiness, the beans, and it made me feel at home. From that night on, the minestrone soup was my Monday night ritual before class, and I loved it each and every time. I haven’t eaten it much since college, but always think about how I need to wrangle a recipe that I love, and I’ve finally done so. And it’s every bit as wonderful as I remembered. This is one of the simplest soups I have ever made, but it does contain one key ingredient – a piece of Parmesan cheese rind. The rind simmers away with the soup and helps to create more of a stock, with an intensified and more developed flavor than if you leave it out. I highly recommend not skipping this! One of the best things about this recipe is that it is easily customizable to suit your tastes (and what’s currently in your refrigerator). Mix and match flavors, different vegetables, and even types of beans. Want to use kale instead of spinach? Go for it! 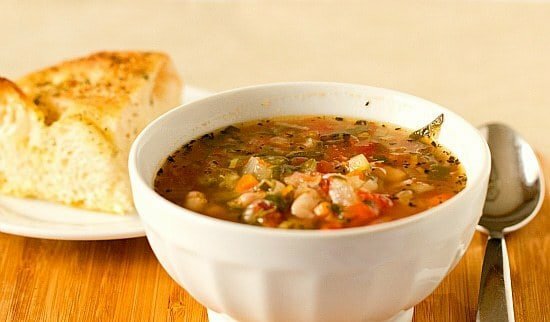 This is a great formula for a completely customizable vegetable and bean soup. Bring the leeks, carrots, onion, celery, potato, zucchini, spinach, tomatoes, water, cheese rind, and salt to a boil in a large stockpot or Dutch oven. Reduce the heat to medium-low and simmer, uncovered, stirring occasionally, until the vegetables are tender but still hold their shape, about 1 hour. Remove and discard the cheese rind. Add the beans and cook just until heated through, about 5 minutes. Remove the pot from the heat. Stir in the pesto. Adjust the seasonings, adding pepper and more salt, if necessary. Serve immediately. This soup looks great! Perfect for a weekend we’re suppose to have… Cold & Snowy! Minestrone is always great and one can experiment a little bit too, for example I love it with a pinch of curcuma, the flavours are enhanced and the colour is just lovely. 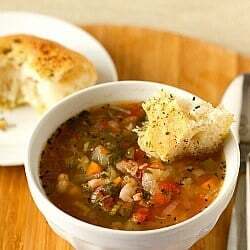 Great minestrone recipe! Gorgeous photos. This may be a dumb question..but can I purchase the parmasan cheese rind a any grocery? Ibuy frash but I can;t remember if it has a rind ! HELP!!! Hi Nancy, I just found out that a grocery store I was at today sells just the rinds, although they have a very large artisan cheese section. I would ask someone in the cheese department and they should know! If you adapt the recipe for a crockpot, when would you put in the cheese rind? At the beginning? Lovely soup! I don’t make minestrone nearly enough… And, it’s so healthy, too! SItting here with a stuffy nose and coughing while thinking this soup could so be the solution to my misery!! I wish I could muster up the energy to go buy the few ingredients we don’t have on hand or in the garden. I will feel better tomorrow for at least the reason that I have to make this soup!!! We’re having a cold and blustery day here and this would go down easily. Interesting note about simmering the soup with the rind from the cheese. Pittsburgh gal and Duquesne grad – I knew this blog was special. If you were a student there way-back in the day then I was one way-way-way-back in the day! Recipe sounds great – will have to try it this weekend. 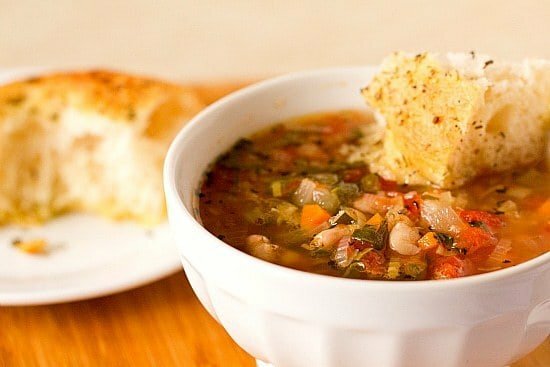 Minestrone soup is such a wonderful classic. My mom would make this with a loaf of homemade bread and it was such a cozy winter meal. She did the cheese rind in the soup and I agree with not skipping this step. Great recipe! last year i made a bnut squash and kale minestrone, but i love the idea of this classic recipe (esp with the pesto!!) –I can’t get enough of warm soup right now! I’d love to try making this – thanks for the recipe! It has suddenly gotten SO cold here in Kansas…So this soup looks perfect right about now! Can’t wait to try it. I remember always loving Progresso minestrone when I was a kid. I haven’t made it from scratch in a while so this might be some inspiration! YUM! This is one of my fav’s as well. I could use that now, my office is freezing. 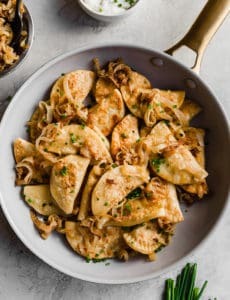 This sou looks amazing and I think I have all the ingredients too, except for the onions, but maybe I’ll replace them with shallots? This is going on my must make list! Oh yeah you could definitely sub shallots! Enjoy! People won’t understand how out of the way Fisher Hall is on that tiny campus – I’m only sad that the deli was no longer there when I attended :( DUQ Grad ’09 :) Love the blog! Oh I love minestrone soup! I’ve never made it though, I’ll have to try this recipe. I’m reading this as I sit at my desk at work, with a space heater about a foot away from my feet. Oh, it sounds sooooo good (even at 8 a.m.)! Ahhhyes… I love the parmesan rind trick. I often throw it in my spaghetti sauce! This soup sounds comforting! This looks beautiful and definitely the parmesan rind is a must. I like the pesto addition too. Very hearty and healthy. 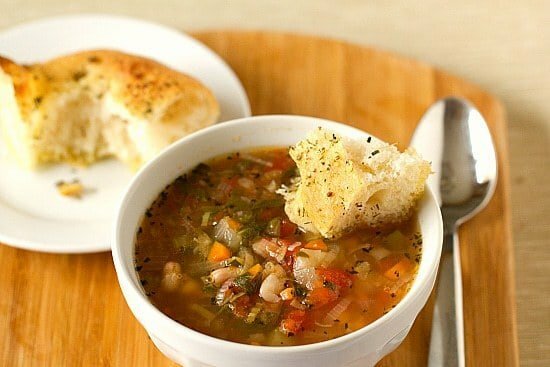 Looks like your version is love affair worthy :) I have always loved minestrone, since I’ve been on several trips to Italy, but it’s not a staple at our house at all, so I never tried to make it. Time to change that! I knew you were in Pittsburgh but I didn’t know you went to Duquesne! My husband and I did too (and lots of my other family members). This post brings back lots of memories of long night classes and the random hallways in Fisher. I really enjoy your blog, thanks for sharing! He & I graduated in ’04. We each had a brother graduate in ’01 too. We’ve moved away but still get back to visit and the campus been majorly upgraded since, it’s nice to see.